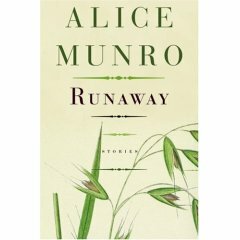 "Alice Munro has been accused of telling the same history over and over, and to a certain extent the characterization is true. Her subject matter is inevitably the vagaries of love between middle-aged people in some rural Canadian setting, trapped there by the combination of their desires and weaknesses. Or, if not love, then at least the mysteries of relationships as characters struggle to understand ach other and themselves. But this thematic single-mindedness can hardly be considered a criticism considering Munro tells stories better than anybody else and with a level of precision matched by few. It would be like criticizing Shakespeare for writing about politics. Runaway is no exception. The stories take place throughout Canada- northern Ontario , the Prairies, the West Coast, Stratford- and feature women and men drifting in and out of each other's orbits, pulled by forces they don't understand. In "Runaway" a woman considers leaving her husband with the help of a neighbor, but the husband has other plans. In "Chance" a woman lives her leave behind in a quest for a man she met on a train crossing the country. Their intertwined lives play out throuh two more stories, "Soon" and "Silence" but the path they follow is as unpredictable to the reader as it is to them. In "Trespasses, a small town's women dream of escaping their lives only to find themselves in lives they never imagined. Munro may be an old-fashioned storyteller, but she understands chaos theory well enough. The same story? Sure. But it's a damn good one".